And now it's time for dessert! But wait… is that even possible? Absolutely! And if you have any food sensitivities, I'm going to show you how to make it egg-free and dairy-free as well! 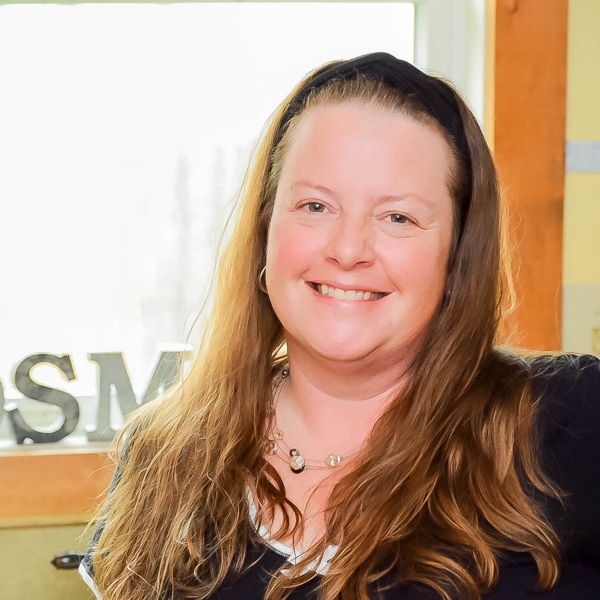 Once you make the transition to Trim Healthy Mama, you commit to a sugar-free lifestyle. Suddenly you no longer eat fats and carbs together (much). That can make desserts seem pretty impossible! This is because real food desserts may have healthy fats — yet often, they have more healthy fats than you should eat in an low-fat (THM:E) setting. Althought honey and maple syrup are natural sweeteners, they still have a glycemic impact not conducive to weight loss. Healthy, real food puddings fall prey to all of these obstacles. For instance, they're typically thickened with nutrient-rich pastured egg yolks. So good, and yet, too high in fat for a THM:E (for Energizing) meal. So what's a Trim Healthy Mama to do? She Should Make This THM:E Strawberry Lime Pudding, Of Course! 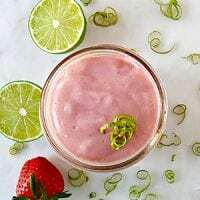 Sweetened with pure stevia extract and thickened with sustainably sourced gelatin instead of high-fat egg yolks, this Strawberry Lime Pudding is light, bright, and fresh! One bite starts you off with sweet strawberry flavor… and finishes with a delicious hint of lime. And, better still, it has just 1 gram of fat per 1/2 cup serving, so it is the perfect way to finish your healthy THM:E meal! This light, bright, and fresh pudding is a perfect THM:E dessert. Only 1 gram of fat per 1/2 cup serving, not to mention egg-free and dairy-free! Makes (6) 1/2-cup servings. In a small bowl or custard cup, combine 2 tablespoons almond milk and gelatin. In a saucepan, combine 2 cups almond milk and lime zest over medium heat until hot and steaming but not boiling (about 5 minutes). Puree strawberries till smooth. You want about 1 cup of puree. A high-powered blender works best, but a blender or stick blender is fine too. 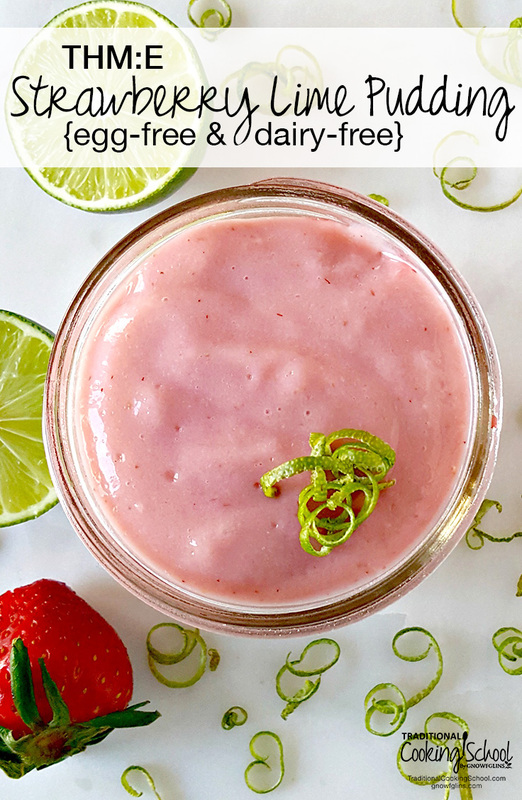 Combine strawberry puree, lime juice, vanilla extract, and salt in a medium-sized bowl. Mix well. When almond milk is hot, strain out lime zest. Gently whisk or stir in gelatin mixture until completely dissolved in hot almond milk. Stir in strawberry mixture until thoroughly combined. Add stevia a little at a time, tasting for sweetness. Cover and chill for several hours or overnight, till set. Before serving, whisk until smooth. Enjoy! Note: For a refreshing treat on a hot summer day, you can even freeze it in popsicle molds. What are your favorite THM:E desserts? Could this be made without the almond milk and with just water? More like a jello than custard? I’m currently nut-free. Wouldn’t this be an FP? Especially if you didn’t eat the whole thing at once?